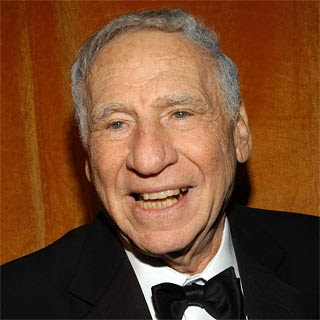 Legendary funnyman Mel Brooks is set to be a featured guest at the TCM Classic Film Festival in April. As part of the festivities, TCM will partner with the Hollywood Chamber of Commerce as they honor Brooks with a star on the Hollywood Walk of Fame*, which marks its 50th anniversary this year. Brooks will also introduce a festival screening of his first feature film, The Producers (1968), which earned Brooks an Oscar® for Best Original Screenplay. Director, producer, writer and actor, Mel Brooks 2001 smash hit Broadway musical The Producers—winner of a record-breaking 12 Tony Awards®. Three of those (Best Score, Best Book of a Musical, Best Musical), along with two Grammy Awards® (Best Musical Show Album and Best Long-Form Music Video), went to Brooks himself. He recently followed it up with the successful Broadway production of Young Frankenstein, which won the Outer Critics Circle Award for Best Musical. Brooks began his distinguished career during television’s Golden Age as a writer for Sid Caesar on Your Show of Shows in 1951. In 1955, 1956 and 1957, he received Emmy® nominations (with others) for Best Comedy Writing for Caesar’s Hour. In 1952, Brooks wrote sketches for Leonard Sillman’s Broadway smash-hit revue New Faces of 1952, and in 1957, together with Joe Darion, he wrote the book for the Broadway musical Shinbone Alley, which starred Eartha Kitt. In 1962, he wrote the book for the Broadway musical All American, starring Ray Bolger. In the ‘60s, Brooks teamed up with Carl Reiner to write and perform The 2000 Year Old Man albums, which became immediate bestsellers. In 1960 and 1961, Brooks and Reiner received Grammy nominations for Best Spoken-Word Comedy for 2000 Years and for Best Comedy Performance for 2000 and One Years, respectively. In 1997, Brooks and Reiner teamed up again for The 2000 Year Old Man in the Year 2000. Both a book and CD were released, the CD winning a Grammy in 1998 for the Best Spoken-Word Album, Comedy. For three successive seasons, Brooks won Emmys for his role as Uncle Phil on the hit comedy show Mad About You. His visionary film company, Brooksfilms Limited, founded in 1980, has produced some of America’s most distinguished films, among them David Lynch’s The Elephant Man, David Cronenberg’s The Fly, Graeme Clifford’s Frances, Richard Benjamin’s My Favorite Year and David Jones’ 84 Charing Cross Road, starring Anthony Hopkins and Anne Bancroft. Last year, commemorating his lifelong contributions to American culture, Brooks was named among the most recent recipients of the prestigious Kennedy Center Honors. The TCM Classic Film Festival, which is set to take place in Hollywood April 22-25, 2010, will be a landmark celebration of the history of Hollywood and its movies, presented in a way that only TCM can, with major events, celebrity appearances, panel discussions and more. The four-day festival will also provide movie fans a rare opportunity to experience some of cinema’s greatest works as they were meant to be seen – on the big screen. TCM will announce additional special events, guests and programming in the weeks and months ahead. The central hub for the festival will be Club TCM, located inside the Hollywood Roosevelt Hotel. The Roosevelt, which served as the site of the first Academy Awards® ceremony, will be the official hotel for the festival. Only passholders will be allowed entry into Club TCM, which will include a festival lounge, panel discussions, social events, a boutique and poolside screenings. Event locations include Grauman’s Chinese Theatre and the Egyptian Theatre.